We encourage club members to compete in local, state and national competitions. Competitions are a great way to fence new people, experience different fencing styles, and to learn a lot more about your fencing strengths and weaknesses. It can be scary to compete outside the club for the first time, but if you choose the right competition then you will be fencing others at a similar skill level, and to go beyond your expectations and win a medal is exhilarating. If you are interested in competing in a state competition, talk to Lisa, our head coach, about preparing for the competitions. Private lessons are available, and the club is planning to run competition preparations as required in the lead-up to major competitions. State competitions suitable for new competitors include age-based competitions for teenagers, novice (if you have been fencing for less than two years) and B-Grade; also the club’s regional tournaments, and the Riverina competitons in September in Wagga Wagga. Go to our Photo Galleries page to see some of our fencers in action at competitions. Sabre: Tim Davis (gold), Charles Liao (silver), Ariel Dingjan (bronze). Junior Sabre: Owen Lee (gold), Finn Stacey (silver), Fabian Miller (bronze). Epee: David Cook (gold), Tim Davis (silver), Josh Masci (bronze). Epee: David Cook (gold), Tim Davis (silver), Remi Lequevre-Akker (bronze). Sabre: Josh Masci (gold), Tim Davis (silver), Cathi Walker (bronze). Foil: Tim Davis (gold), Hayley Anthony (silver), Phil Taylor (bronze). Junior foil: Ben Martin (gold), Oscar de Jong (silver), Each Zhang (bronze). Congratulations to everyone who competed. This year saw the top 2 rankings for the Club Challenge swap around, with Tim Davis winning the Club Challenge Cup, and Phil Taylor as runner up. 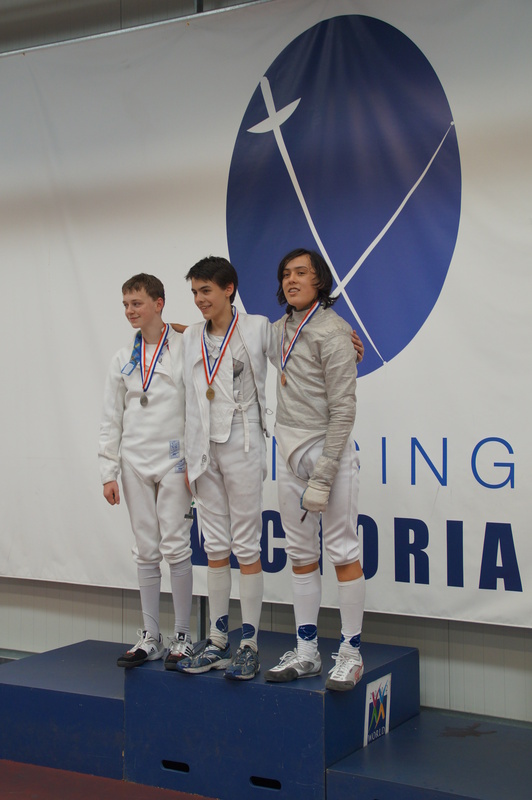 Congratulations to our fencers who competed in the National Championships in Canberra on the first weekend in December 2014. David Cook came third in the Oceania and AFC Veterans Epee! In Open Epee, David Cook finished 20th and Sean Williams finished 54th. In Open Sabre, Tim Davis finished 29th. Congrats to David and Phil, who finished 2nd and 4th in the State Veterans epee championships at the end of November! The Club Challenge aims to get people fencing lots, and fencing everyone. You can start accumulating points at any point throughout. Remember, the more Challenge Cup bouts that you fence, the more points you get. These involve separate competitions within the club for foil, epee, sabre and junior foil. They are held at the end of every calendar year. – Fencing Victoria Open, B-grade, Novice, Veterans and age-based competitions. – Fencing Victoria State Teams competitions. – Australian Fencing Federation national open and age-based competitions. – Fioretto Eastern Regional Competitions. – Coeur de Lion foil competitions.